When I read recently Mathias Enard’s Zone, I made a note of some writers mentioned in the text that I wanted to follow up on. One was the Greek poet CP Cavafy, whom I’d never even heard of before (even the most famous poets tend to be pretty obscure if they’re not studied in schools, and Greek poets aren’t studied in UK schools). It turned out that presently there are at least three competing major translations of Cavafy. I settled on the Keeley and Sherrard translation, the longest standing of the current crop, but it was a close run thing. 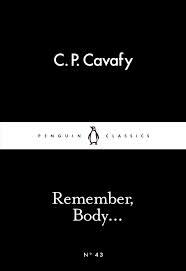 Then though Penguin had it’s rather wonderful Little Black Classics idea, and one of them was an excerpt from its own Cavafy translation by Avi Sharon. I’d already committed to the Keeley/Sherrard, but the prospect of a pocket Cavafy was too tempting to resist. Cavafy is a poet of desire and regret. Most of the poems here are very short, a paragraph or two. They exist primarily in memory, a reverie of loves once known and lost. Cavafy was gay at a time when that was illegal, and his encounters are therefore both circumspect and fleeting. The poems are written from the perspective of age, brimming with nostalgia for moments stolen from the world years before. For Cavafy, youth and beauty are linked. To be old is to be separated from that you most want to possess, leaving only the wistful recollection of pleasures past. There’s a limit to how much I want to say about what is a very short collection (though a very good one). Some of Cavafy’s “greatest hits” are left out, most notably Ithaka which is his most famous work (a poem I find a bit trite, not true for most of his). Penguin though would obviously like you to treat this as a taster and to move on to the full collected works they publish, and that’s fair enough. Sharon’s translations are smooth and evocative, reading as if poetry written in English. Whether they’re faithful I can’t say, I don’t speak Greek, but they work here. Put simply, this is a great little collection. It’s a marvellous introduction to Cavafy, and while I’d already bought a larger collection of his work if I hadn’t this would definitely have convinced me to do so. All that said, there’s no better way to illustrate a poet than by quoting from their poetry. Here are two complete Cavafy poems from this collection, both of which were among those I particularly liked. I had planned to also quote his wonderful The Café Entrance, but WordPress breaks the lines which isn’t fair to the poem. of a tobacconist’s shop, they stood amid a crowd of people. the illicit longing of their flesh. they smiled and gently nodded. the hands, the lips coming together. tucked above a suspect tavern. came the voices of workmen playing cards and carousing. all alone in this house, I am drunk with it again. hidden above that suspect restaurant. who were playing cards and having a carouse. The Mendelsohn works least well for me here. Having a carouse seems odd, like something from a Carry On film, and I dislike the use of the exclamation mark (though I understand it’s in the original). Threadbare and tawdry too has less impact for me than cheap and sordid or shabby and miserable. Getting even more specific, Mendelsohn’s choice of the word restaurant is interesting. Taverna is a much more colloquial term, one that for me immediately evokes a certain kind of restaurant. Tavern to a degree does the same, but is less specifically Greek, it’s a halfway house between the Mendelsohn and Keeley/Sherrard versions. Aguably, however, Taverna is redundant. It’s essentially a word for a small Greek restaurant, but it’s obvious this isn’t a grand establishment from the rest of the poem. Mendelsohn is perhaps being more precise by avoiding the more clichéd term (and there’s no confusion in his version as to what kind of place Cavafy is remembering). I think though that Mendelsohn pays a price for his precision with a certain loss of romance compared to the Keeley/Sherrard. Sometimes, cliché works. Another point I noted is that the Sharon uses intoxication and intoxicating where the Keeley/Sherrard repeats intoxication and Mendelsohn repeats drunkenness. I think drunkenness loses a sense of liberating joy, but coupled with rose-colored it does bring to mind the famous wine-dark seas of Greek myth which is surely no accident. Sharon avoids repetition, but at a cost to rhythm. It would be fascinating, though beyond my current appetite, to go line by line comparing each version of the poem. Greek doesn’t map directly to English, what language does? Every translator then makes choices, and every choice carries nuances, and in poetry nuance is everything. I doubt there’s a right or wrong here, just decisions as to fidelity, atmosphere, structure, meaning, and how to balance between them. Ultimately, all three are very highly regarded translations. The Cavafy reader is spoiled for choice, which is why I spent a good couple of hours in Foyles deciding which version I wanted for myself. I’ve criticised the Mendelsohn here most, but I was actually very impressed by it and while ultimately I thought the Keeley/Sherrard better for me that wasn’t a quick or easy decision. Similarly, the Sharon’s worked well, read well, had power. It’s hard here to make a bad choice. I don’t know of any on the blogosphere, but if you do please let me know in the comments and if you’ve reviewed it yourself please feel free to leave a link to your review below.